My sister came to visit me today, because she’s looking for a prom dress! Whee! So we spent the afternoon perusing East Village boutiques with my roommate’s puppy, Toni. Then we went to lunch (though, sadly , restaurants were only serving brunch still, at 4pm!!! ), but I wanted desert, so I decided to try this Kosher-for-Passover (no leavening agents), pareve chocolate chip cookie recipe, since Passover starts this Saturday. (My friend, Jackie, and I are having a seder (aka an excuse to go to Zabar’s), and I am super excited!) Coincidentally, I am watching a PBS documentary, “A Yiddish World Remembered”, as I write this. Yiddish is apparently experiencing a revival amongst young Americans, which is pretty cool. Anyway, the cookie is pretty crisp and really spreads. 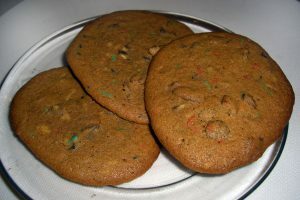 You could refrigerate the dough to minimize this and make the cookie a bit less crispy, but I tried both ways and preferred the crispy version. My photos look slightly different because I didn’t really have chocolate chips, so I threw in some sprinkles and pecans. 1. In a large mixing bowl, cream both sugars with butter. Add vanilla. Blend in the eggs. 2. Stir in the salt, cake meal and potato starch. Fold in the chocolate chips. 3. Chill the dough for 1 hour or overnight for chewy cookies, do not chill if you prefer thin, crisp cookies. Preheat the oven to 350oF. Line 2 baking sheets with parchment paper. 4. Scoop out generous teaspoonfuls of dough or roll marble sized balls. Place on the baking sheets, leaving plenty of room for the cookies to spread (3 ½ inches). Press down a little if using chilled dough.